An online petition was launched last week to stop a proposed fence at the Tulelake Municipal Airport, site of the former Tule Lake Segregation Center in Modoc County. Tule Lake was one of 10 “relocation centers” established by the War Relocation Authority to detain Japanese Americans from the West Coast. In 1943, it was designated as a segregation center for internees who had been labeled as “disloyal,” and it continued to operate even after the end of World War II, until 1946. The Tule Lake Pilgrimage is held at the former camp site every other year, and Tule Lake is now part of the National Park Service’s WWII Valor in the Pacific National Monument. It is located near the town of Tulelake in Siskiyou County. According to the petitioner, the San Francisco-based Tule Lake Committee, “The proposed fence will desecrate the physical and spiritual aspects of Tule Lake … Japanese Americans … while attempting to mourn their own past, will instead be assaulted with the reminder of rejection, exclusion and emotional pain. 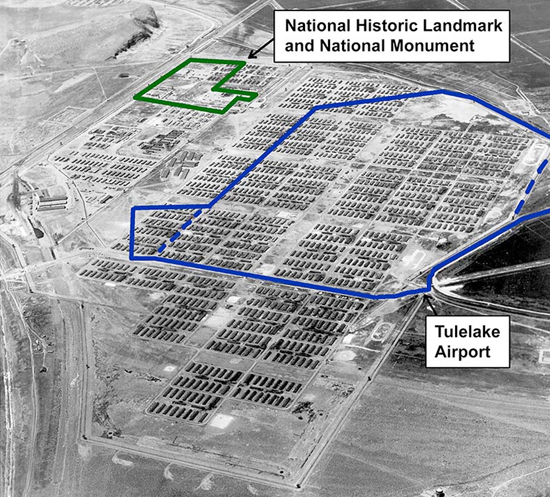 The locations of the Tule Lake National Monument and Tulelake Municipal Airport superimposed on a wartime photo of the Tule Lake Segregation Center. The message to FAA Administrator Michael Huerta states, “Surrounding the Tulelake Municipal Airport with a three-mile-long fence will have a detrimental and negative impact to the site where 18,000 people were imprisoned during World War II. Site tours would no longer be possible, and visitors could no longer experience the dimension and magnitude of the concentration camp where people walked long distances to eat meals, attend school, do laundry and use the latrines. “The site, a portion of which received designation as a national monument in 2008, housed the largest number of prisoners, stayed opened the longest and was the place where ‘troublemakers’ from other camps were sent. Click here to see the petition on change.org.